The province is investing in Edmonton’s Valley Line West LRT expansion to provide more affordable public transit options for Albertans in the capital region. 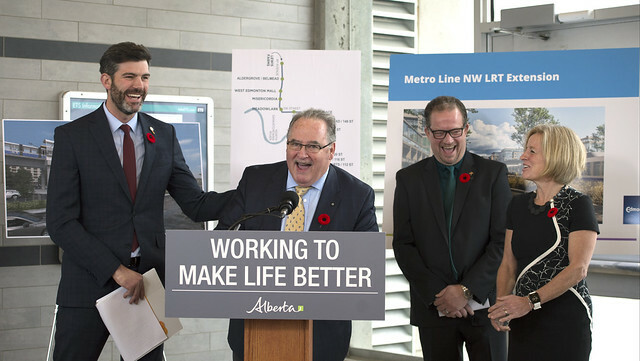 (L to R) Mayor Iveson, Minister Mason, Wade Coombs and Premier Notley celebrate the Alberta government investing $1 billion in the Valley Line West LRT expansion. The route expansion will move 60,000 Edmontonians between downtown and Lewis Estates every day, providing a faster commute which will mean more time to spend with families and friends. The province is also investing in the Metro Line expansion from NAIT to the new Blatchford community, which will serve thousands more commuters daily. The finished route will bring suburban communities and the city’s core together, running from Mill Woods through downtown to the west end, with connections to LRT and bus routes covering the entire city. The 14 stops include West Edmonton Mall, the Misericordia Hospital and the Brewery District. The Alberta government is investing $1 billion, or 40 per cent, of the city’s expected $2.6-billion Valley Line West LRT expansion cost. The province’s commitment to the Metro Line totals $131 million of the $328-million project. The Government of Alberta will continue working with the City of Edmonton as detailed plans and finances for the city’s full LRT expansion are developed. The province is committing $1 billion to the Valley Line West and $131 million to the Metro Line expansion project. Revenue from the Climate Leadership Plan, including the carbon levy, will be reinvested to grow and diversify Alberta’s economy and rebated to Albertans. Support for green infrastructure projects, like transit, are included. The construction of the Valley Line West project is expected to support 20,000 direct and indirect jobs in Alberta with an additional 5,300 jobs in the rest of Canada, during construction, operations and maintenance phases. The route is projected to be complete in 2026. The Valley Line west is projected to move 40,000 passengers daily in 2027 and 60,000 in 2047. The Valley Line Southeast expansion is expected to support 17,000 direct and indirect jobs in Alberta with an additional 1,600 jobs in the rest of Canada. Phase one of the Metro Line NW LRT extension is expected to support 2,830 direct and indirect jobs in Alberta, with an additional 860 jobs in the rest of Canada, during the construction, operations and maintenance phases. The Edmonton Metropolitan Region is one of the fastest growing regions in Canada, with 1.2 million residents (2016). By 2044, the Edmonton Metropolitan Region is expected to nearly double in population to 2.2 million residents.